Oh my, it’s been a couple of months since I’ve added anything here. I’ve been too busy weaving to write! I think I’ll be a new weaver forever. It’s so much fun to just try stuff and see what happens. These shawls were from yarn picked up at give-aways at my weaving guild. Off the loom, it was a little stiff and I did a lot of reading on finishing silk. Apparently, to get the gum out of raw silk you have to boil it, and that wasn’t an option with this large a piece. I finally settled on steaming – holding the iron above the cloth on full steam – and amazingly, that softened it up, so it has a nice drape now. 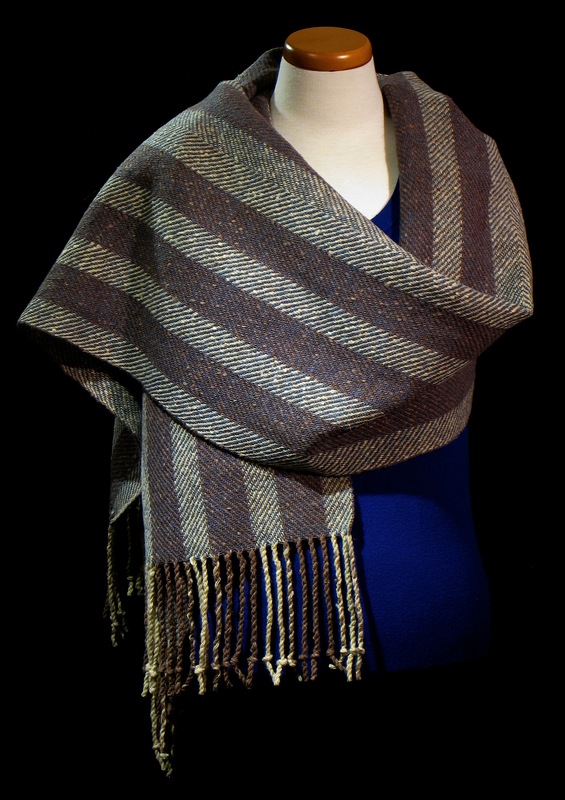 The second shawl was from handspun yarn. When I picked it up at the weaving guild meeting, I didn’t even realize it was all the same yarn in three colors. Bonus! 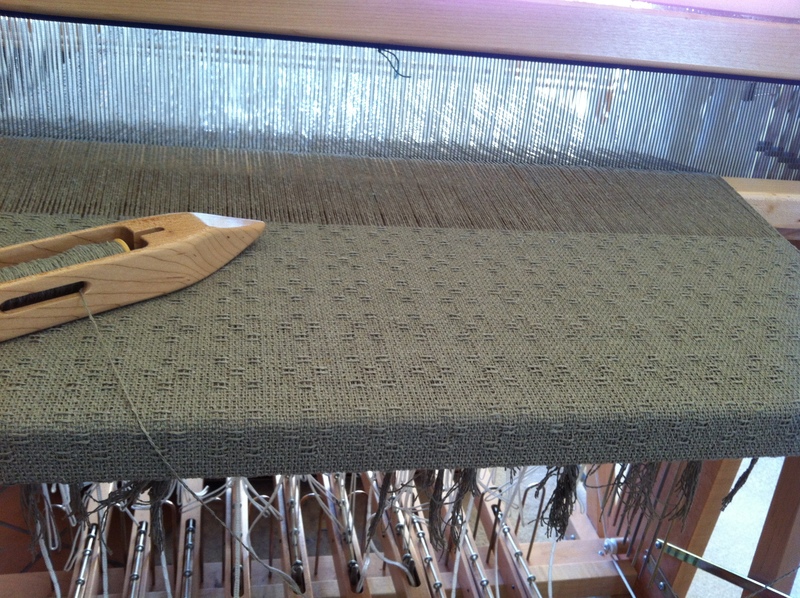 At first, I warped another stripe of brown on each side, but I was afraid I would run out of weft, so I took that off, just leaving two threads of brown at each edge, which I’m glad I did. 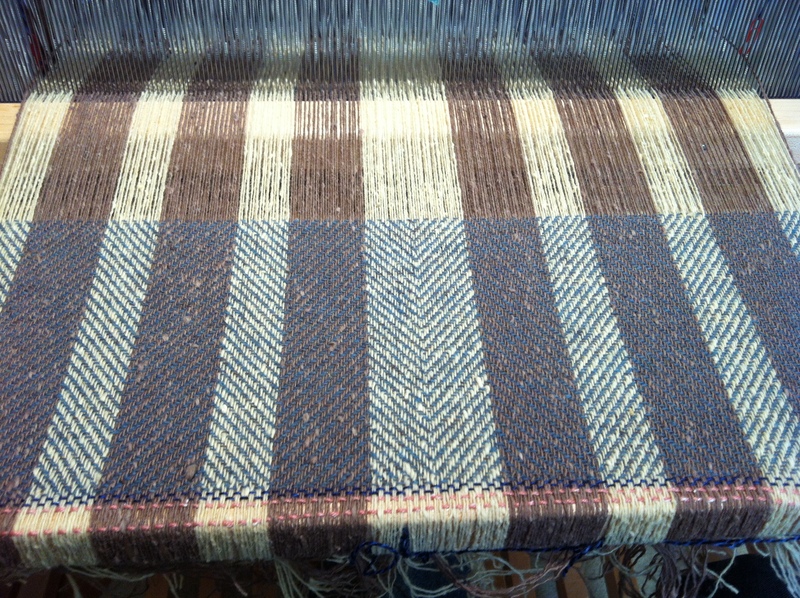 The structure is 2/2 twill, with the cream and brown angled in different directions, mirror imaged in the center (I’m sure there’s a more technical term for this pattern, but I think “point” has to do with changing the treading sequence, which I didn’t do – so much still to learn). There were some new experiences with this wool. There was a lot of lanolin or spinning oil, especially on the cream yarn. All the yarn was pretty twisty, but there was extra twist on the cream yarn, and since the last cream stripe was so close to the edge, the corners really curled up when it came off the loom. I washed it in the tub with regular detergent, hot water, and agitation, and it fulled up a little. I dried it hanging over the ironing board, and then ironed it. The curled corners eventually straightened out with ironing. 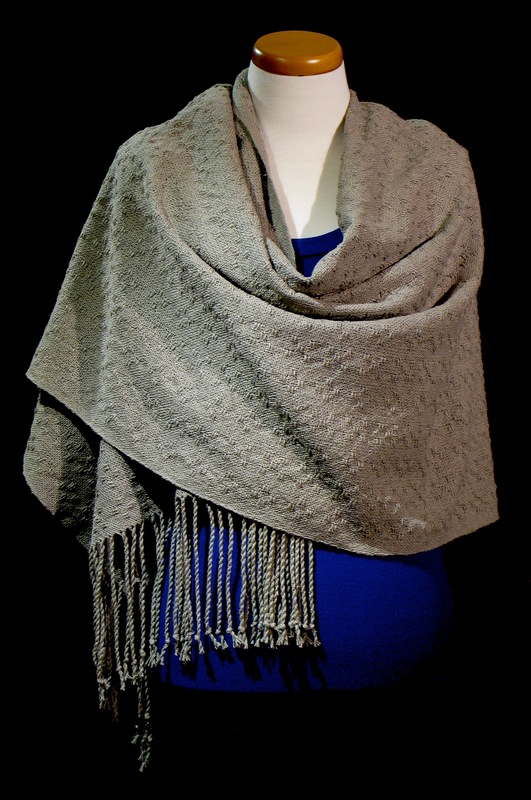 The end result is that this shawl is a little like a horse blanket, but it drapes enough, and should be warm!! Note: I put these and the shawl from my last post (2/26s wool) in a meeting room that is often chilly, and people use them often!! Yeah! !